Because of this week’s weather I was limited to a single walk this week. Fortunately, I keep a close eye on the weather forecasts and knew that might be the case, so I planned accordingly. I assembled a list of places I wanted to go, and then chose from that list places that I could logically string together into a single walk. It ended up being something of a loop, and as it turns out the places I investigated were mostly ones that are sitting empty. This waterless car wash (they used their own product, which you can buy on the internet) seems to have quietly closed up shop. From what I can see by peering into the windows, the place has been emptied out. I did a little checking on the internet and although I didn’t find anything that indicated why they’ve closed, their Yelp reviews tell an interesting story. When the car wash started out they received rave reviews: people seemed to love their product and, more importantly, their service. 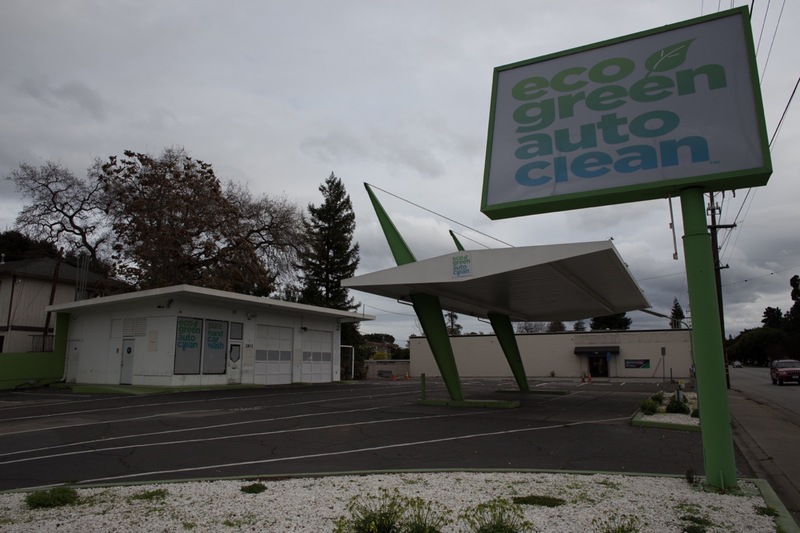 But according to some of the reviews it appears that the car wash was sold in early 2018, and that the new management didn’t seem able (or willing) to maintain the formerly high standards. Many of the reviews since the apparent sale are pretty damning; if they truly reflect what the typical customer experienced, this business may have closed simply because it was run into the ground. All of the permanent signage has been stripped from this building, and the interior has been cleared out. There is a rather prominent banner next to the door (visible in the above image; click for a version you can zoom in on) that says “We’re Moving” and gives a new address of 99 Beech St. That address, in case you are wondering, belongs to Towne Ford: it is the lot across Beech Street from the main dealership, at Lathrop Street (behind Hopkins Acura). Presumably Enterprise now has a relationship with Towne Ford; if you take your car in for service and need a rental, I assume that they point you across the street to where Enterprise has a desk. Or does it? Because I was on foot and thus could look closer, I read the signs affixed to the glass doors. Those signs tell a different story. 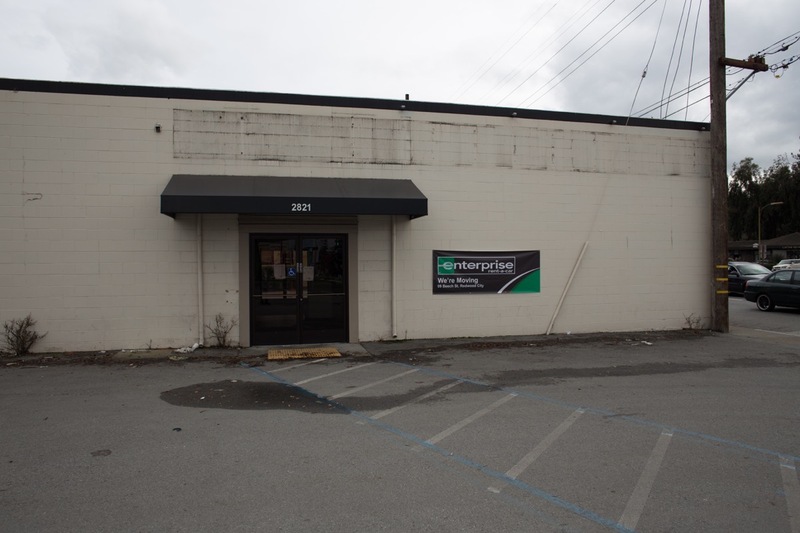 They say that as of January 5, Enterprise has moved to Redwood City (the above building is beyond the city limits, in an unincorporated section of San Mateo County), and give Enterprise’s new address as 345 El Camino Real. That address is…an Enterprise Rent-a-Car facility. It has been one for many, many years now, so this “move,” at least according to the inkjet-printed signs someone has taped to the glass doors, is really just a closure of this particular location. 67 studio and one-bedroom apartments for households with incomes between 30%-60% of the Area Median Income (AMI). Twenty-seven units will be reserved for homeless or at risk veterans and an additional six units will house homeless/at risk individuals with mental illness. It’s a nice looking place, really, and will be a nice substitute for what is there today. It is just too bad that they can’t take over the next-door car wash property as well, and build a really large project. Just one block further down I spent some time prowling around the former home of John Bentley’s restaurant and the single-story office building at the corner of El Camino Real and E. Selby Lane. These two parcels, along with three that are currently used as surface parking lots, plus a sixth parcel that adjoins in the rear and faces onto Markham Avenue (it currently has a house on it) are, according to plans, to be combined and developed as a Sunrise Senior Living facility. The combined site is roughly 1.4 acres in size, giving it plenty of room for a nice-sized development. 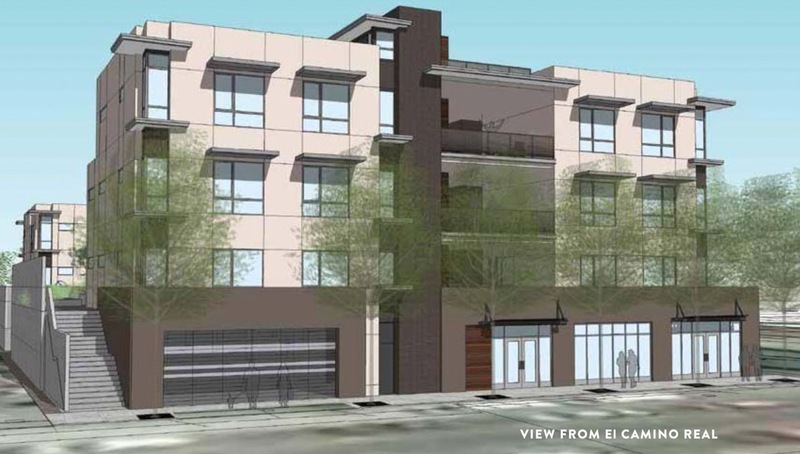 The design calls for 90 units in a building that will be three stories high along El Camino Real, stepping back to two stories in the rear along Markham Avenue. The office building seems to be largely, if not completely, empty. 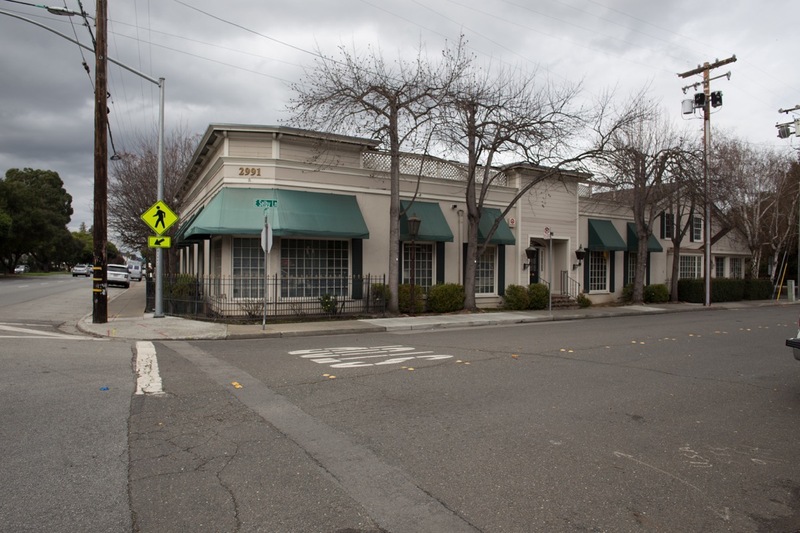 As for the two-story ivy-covered John Bentley’s building (which sits adjacent to Planned Parenthood, on El Camino Real), that has been sitting empty since last April, when the restaurant closed after more than 22 years. Between and behind both buildings are some rather extensive surface parking lots: I’m not sure why someone thought that all of those spaces would be needed. It is nicely done, and actually signed (or labeled) “The Graffin Family” so perhaps this was done with someone’s permission? In any case, this “mural” will be torn down along with the building if and when the project gets underway. The project appears to have gotten the necessary approvals, so I do expect that this project will start either this year or next. Speaking of animal hospitals, in order to get to and from all of the above properties I had to walk past the colorful buildings along El Camino Real that I’d recently reported were being remodeled into the Mid-Peninsula Animal Hospital. Although the banner still has a large “Coming Soon” printed on it, don’t believe it: the hospital is very much open for business, as evidenced by the “Open” sign by the entry door. They appear to be using the large building to the right as a parking garage. The Animal Hospital itself is located in the blue and the brick-red buildings. The main entrance is through the door in the blue building, beneath the banner; the doors on the old “Spin City” laundry building (the brick-red one; it still has the laundromat sign above it) have signs directing you to the main entrance in the center building. On my way home I swung by Redwood City’s Cost Plus World Market, just to get some pictures of the signs advertising that store’s closure. Cost Plus appears to prefer keeping things close to the chest: they don’t seem to publicly comment on individual store closings, which this is: the chain itself appears to be OK. I’m guessing that the closing of our store is just part of an effort to prune away their low-performing stores. But that is just speculation on my part: I have yet to find anything that definitively says why our store is closing. I also swung by Sequoia Station to peer inside the old Max’s restaurant location. Max’s closed in mid-December, and according to an article in Climate Magazine, they closed because their rent “almost doubled.” Hopefully the shopping center owner knows that they can lease out that space at their new, increased price: I would certainly hate to see that rather prominent storefront, which sits right on El Camino Real, go empty for long. As far as the company goes, Max’s appears to have been slowly closing stores over time. For instance, they closed their location in the Stanford Shopping Center at the end of last June, after some 30 years, also due to “lease issues.” The Stanford location is being replaced by another restaurant; perhaps that will happen here, as well. Regardless, if you miss Max’s, their original location in Burlingame still seems to be open, as is, I believe, their Max’s Opera Cafe in San Francisco, and their location in Auburn, California. Enough with closings! Personally, I’m going to focus on the future, and what will possibly replace those now closed businesses. The affordable housing project that is slated to replace the Enterprise Rent-a-Car building, and the Sunrise Senior Living facility that is planned to replace the buildings down by E. Selby Lane are good examples of how unused, or underused properties can be put to more productive use. These days we shouldn’t have empty properties sitting around for long: the need to make them productive is simply too great. Thanks for the kind words. You can follow my blog, if you don’t already, by simply entering your email address into the “Follow blog via email” box at the top of any of my posts. As for my Daily Journal articles, I’m not sure that there is a way to get notified when my columns are published (if anyone knows of a way, by all means let us know!). However, my columns come out every Saturday in the Opinion section, so you could just bookmark that and check in once a week. what is happening with the lot that was formerly occupied by Bonsai Restaurant and which was partially pulled down quite some time ago. There was talk of a dentist going into this space but there is a For Lease sign up still. Thanks. I don’t actually know what is going on with that place, but I’ve been watching it with great curiosity ever since they began “remodeling” the place. I’m guessing that they had a tenant lined up and were in the process of remodeling to suit the new use, but that things fell through and now they are waiting to line up someone new before the rebuild the building. But that’s just a guess; I don’t actually have any information on that place. I’ll put it on my list of things to look into, though. Was wondering if you know how to find building permits issued in San Carlos? I know you post about it for RWC. Thank you. You have to create an account, but that is simple enough to do. Hopefully some lower cost retail will arise as our lease is up in about 16 months and will not be extended by our landlord. Looking at what prices are now more than likely we will close after being in Redwood City 42 years. Oh, no — not you guys! The closure of your store would be a huge blow to Main Street, and to the city as a whole, in my opinion. Certainly, my wife and I would be very sad to see you go: we’ve purchased vacuums from you, and you periodically service her sewing machines. You always do a great job, and your store is very convenient for us (especially since you have that parking lot in the rear). Independent retailers like you are what make Redwood City truly special, I feel, and we need to do whatever we can to help support and preserve such businesses. Here’s hoping you find somewhere at a rent you can afford. Regardless, thanks for being there all these years. Is Planned Parenthood part of the Sunrise Living development? I drive past Mid Peninsula Pet Hospital all the time. They really need to remove the Coming Soon sign as I had no idea it was open or that parking was in the building next door. I was wondering where everyone was going to park as there is no parking in that area. Max’s – I do hope that landlord has a plan whether that be a new tenant or remodel. 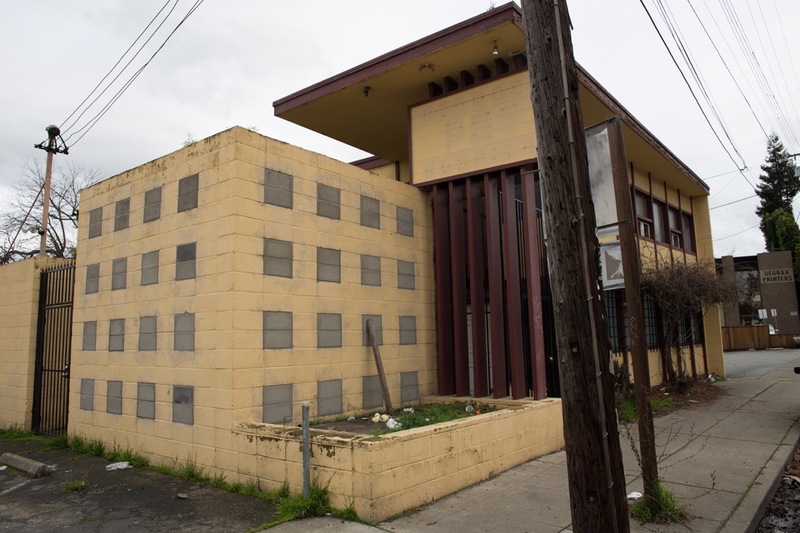 If it is anything like Chili’s in Menlo Park or McWhorters, the landlord will never make up the lost revenue by raising the rent and having Max’s leave. Both Chili’s and McWhorters were priced out (or refused a lease renewal) and the locations were left empty for years! No way a landlord could make up the lost rent. Cost Plus – I bet their lease ended after ten years and the store never gained traction. It’s a shame as we need more retail downtown. A cashier at Cost Plus told me that one of the negatives of the location was that if people bought furniture, there wasn’t an easy place to load the furniture into their cars. Perhaps that contributed to the decision to leave the location? @Sunny: There are a few parking spaces reserved for loading adjacent to the front door of the store on Jefferson. It may have been a small contributing factor, but I can’t believe that it was a major one. There are loading zone spaces right along Jefferson pretty close to the Cost Plus doorway, and if people were abusing those spaces (and thus not leaving them open for people needing to actually load furniture) I would think that Cost Plus would have complained to the city and something would have been done about it. It might have been one of multiple factors that added up to their decision to leave, though. 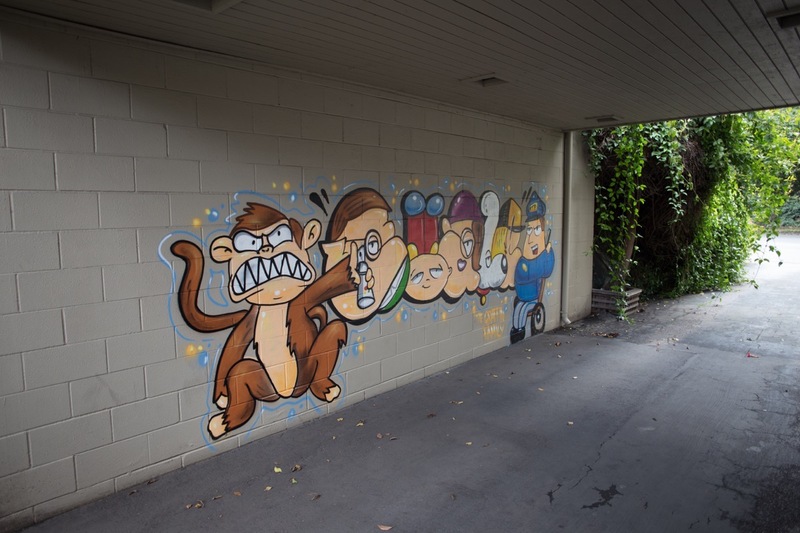 The Graffin Family is likely a reference to the fact that this is a graffiti depiction of the Griffin family from the Family Guy show. Ah, good to know. Obviously, I don’t watch that show. 😎 So it appears that this really is just graffiti. I find it interesting that someone would spend so much time and effort on something that almost no one will see. Hey Greg, good stuff. As always. Whoever moves into Max’s location will not be signing a long-term lease. There are already discussions underway by a developer on a complete redo of Sequoia Station. As I said for years, one of the byproducts of the neglect of Sequoia Station will be that some folks will beg to bulldoze that place. One final item of note…Sequoia Station is zoned 10-12 stories courtesy of our Downtown Precise Plan. Indeed, the future of Sequoia Station has been a matter of discussion for some time now, and I’ve been aware of the move to chop it up and redevelop it for years. I’ll have to see what I can find out about the future of that center.